What Animal Has Two Sets of Teeth? The tuatara has two sets of teeth in his upper jaw that he uses to slice his food rather than grind or chop it. His dual upper teeth are among many intriguing characteristics of this rare New Zealand reptile, which make him a popular subject of scientific study. Sphenodon punctatus and the much rarer Sphenodon guntheri are the only two species of tuataras roaming the earth today. They look much the same as their ancestors did more than 200 million years ago. Although they appear to be lizards, tuataras are the only surviving members of an order of reptiles called Rhynchocephalia; they belong to the family Sphenodontia. Their nearest relatives are believed to have become extinct more than 60 million years ago. Despite their outward appearance, which has changed little since the age of the dinosaurs, scientists have determined that their genetic makeup is rapidly changing. Intrigued by the tuataras’ double set of upper teeth, Scientists at the University of Hull in England used computer simulations to further their understanding of the chewing actions of tuataras.They determined that the tuatara’s lower jaw fits between the grooves of the upper teeth and slides back and forth in a slicing motion, cutting food apart in much the same way scissors work. It’s also interesting to note that tuatara teeth are solid projections of jawbone, and they are not replaced once they become broken or lost. Aside from its unique two sets of teeth, the tuatara have a third eye that is clearly visible when young. This pineal organ is located on the top of the head. It has a retina and lens but it does not produce images. Scientists believe that it may help the tuatara determine time of day and season of year. 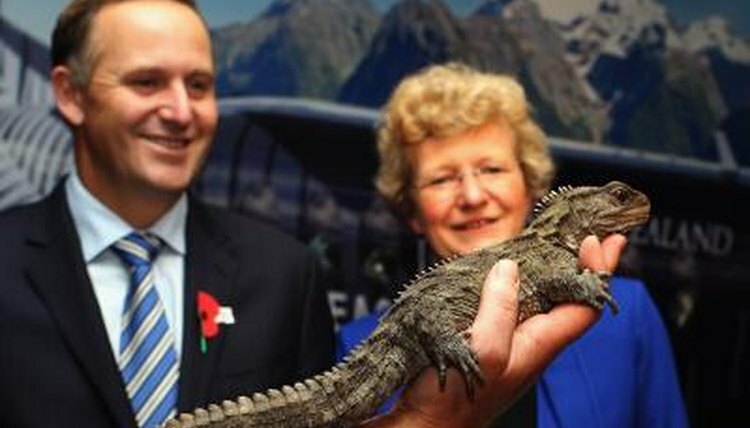 As the tuatara matures, scales cover this eye. Tuataras are about 16 inches long and look similar to iguanas; like some lizards, they can regenerate a lost tail. Tuataras do not have external ears, but they are able to hear. Although they are cold-blooded, tuataras are able to stay active even in near-freezing temperatures thanks to the enzymes of their specialized hemoglobin. Perhaps their most enviable characteristic is longevity. They have been documented to live for more than 100 years. Tuatara in the wild exist only on the islands around New Zealand. They became extinct on New Zealand’s mainland because of the rats, cats and dogs that accompanied Polynesians to the country around 900 years ago. Scientists estimate about 50,000 tuataras exist today. Stephens Island is home to about half of these. Brothers Island has the only wild colony of the smaller tuatara species, with a group of about 600. The New Zealand Department of Conservation's efforts to hand-raise tuataras and re-establish them on islands that have declining populations have been very successful, thanks in large part to more advanced methods of eradicating rats. The San Diego Zoo is one of two zoos in the world that house a colony of Brothers Island tuataras, but they are not on public display.